Biography & Genealogy: Albert G. Rennolds, Class of 1863, Honorary Graduate. Genealogy : Born- June 11, 1841 at Rockland, near Tappahannock, Essex Co., VA. Father- Otway Rennolds. Mother - Malvira Cason. VMI Record: Matriculated from Tappahannock, Va. on August 16, 1860; at VMI 1 year (entered sophomore year). Declared Honorary Graduate July 2, 1869. Military Record: Drill master, Richmond, spring 1861. Enlisted October 21, 1861 at Lowry Point for 1 year as Private, Company F, 55th Virginia. Sick December 1861. 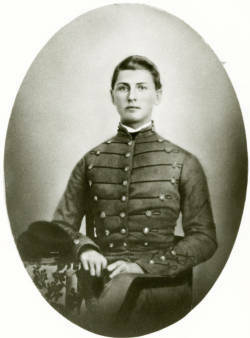 Elected 2nd Lt (date of rank April 15, 1862). Wounded in action and commended for conduct at Mechanicsville. To 1st Lt June 30, 1862; Capt July 26, 1862. Absent without leave on February-March 1863 rolls. Severely wounded in action May 2, 1863 at Chancellorsville. Severely wounded in action at the Wilderness. Wounded in action August 18, 1864 at the Weldon Railroad. Captured at Sayler's Creek April 6, 1865. Held at Johnson's Island, Ohio. Released on oath June 19, 1865. Marriage: To Hannah Christian Trible 1867. Four children - 1. John Trible Rennolds 2. Benjamine Cason Rennolds 3. Albert Christian Rennolds 4. William Gregory Rennolds. Occupation: Farmer. Death: April 9, 1903 at Rockland, Essex Co., age 61. Died- April 9, 1903 in Rexburg, Va. Buried at Rockland.